The Riddler – Will You (Yes, You) Decide The Election? Twice is always nice, so I’m going to tackle the Classic Riddler for the week as well. For those that aren’t familiar, The Riddler is a weekly puzzle series from Oliver Roeder at FiveThirtyEight that usually involves some combination of math, logic and probability. You are the only sane voter in a state with two candidates running for Senate. There are N other people in the state, and each of them votes completely randomly! 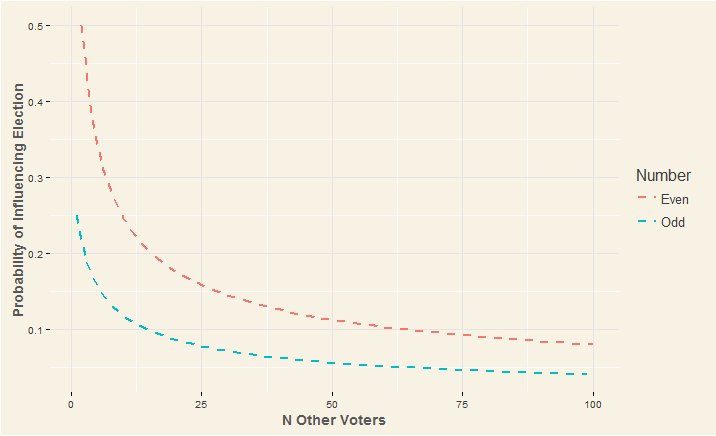 Those voters all act independently and have a 50-50 chance of voting for either candidate. 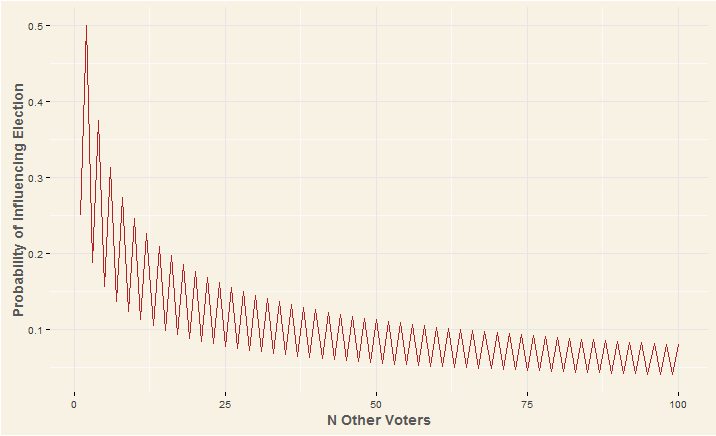 What are the odds that your vote changes the outcome of the election toward your preferred candidate? More importantly, how do these odds scale with the number of people in the state? For example, if twice as many people lived in the state, how much would your chances of swinging the election change? @ianrhile assume a coin flip if you’d like. or just assume an odd number of voters. The nearest integer function (as denoted by [x]) rounds down a number to nearest integer (e.g. [2.5] = 2). Cool, now we know for a given N which scenarios we can actually influence. nCr(n,k) = Amount of unordered combinations for a given k objects in set of n total objects (e.g. how many unique ways can you have 2 heads given 5 coins). Defined by n!/((n-k)!*k! ).